Gazmend Freitag is truly a unique individual. His early childhood is characterized by the visible talent of drawing. Alongside drawing, Gazmend was very interested in literature, which made him remarkably different from his siblings. While different school awards are well racked up on Gazmends personal shelf, it is his path to success that brings his story to KosovoDiaspora. Gazmend Freitag had finished his second semester of Law School (1988) when his life would take a turn. Following the forced closure of the University of Prishtina and student demonstrations, Gazmend Freitag, being a part of the revolt, found himself in a difficult situation. The rather hopeless situation forced Mr. Freitag to leave for Germany, where he once again got back to his true passion for drawing and painting. 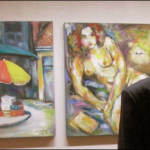 Despite his parents’ desire of him becoming a lawyer, Mr. Freitag pursued his dream and took classes at various art institutions between 1990 -2003. On 2013, Mr. Freitag begun his studies at the Linz University of Arts, specializing in Nudes. Mr. Freitag is showing great success under the supervision of the famous Annelies Oberdanner. Being a painter as every other craftsmanship takes dedication and time. Mr. Freitag has been attending private lectures of a number of experienced painters. His works cover a range of topics: autobiographic, surroundings, landscapes, various portraits, childhood memories, nudes and many others. Mr. Freitag’s favorite tools are graphite pencil, chalk and fountain pen as well as oil for canvas paintings. His work truly represents the sensitive nature of an ambitious author. KD: How was your experience at Biennale? My attendance of the Bienaleld easily be considered as a climax of my creative work. 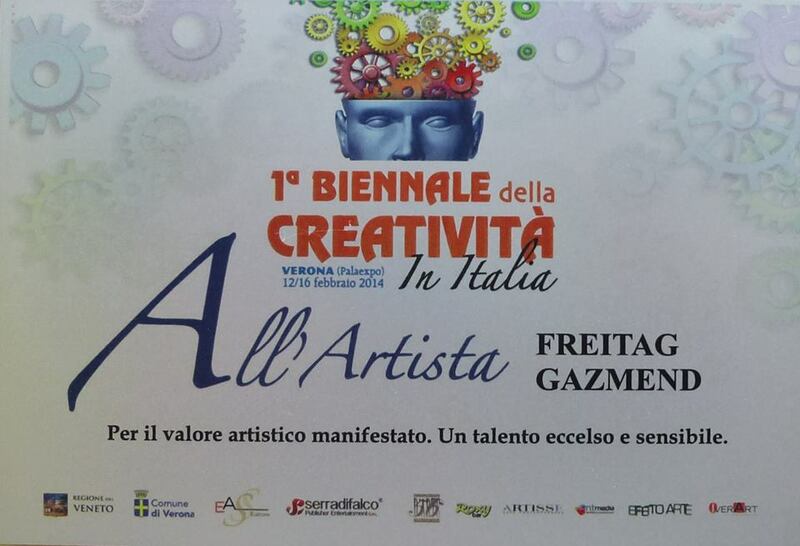 It has been a privilege to take part at an international event where art of high caliber is presented and valued. I have presented two of my paintings, paintings that have been selected by the Editors; “Baresha” and “African Dance”- both oil paintings. My work and personal biography have been presented on the catalog, both in English and Italian, specifically the painting under the title “Baresha”. Through this event, I have had the chance to meet with the world renowned Art Critic, Mr. Vittrio Sgarbi, who gave a lot of positive feedback on “Baresha”. KD: What projects are you working on now? I have been a member of “Galeriestudio38” for a year now. The gallery is based in Vienna where I am professionally represented by curator and head of the Gallery, Madam Ursula Pfeiffer. Currently I have an exhibition open with two Austrian painters under the theme of “Ginger und Fred”. The exhibition is based in Vienna and awaits visitors until the end of May 2014. We have been working on a new project with the theme “Beautiful Moments” where I will be selecting work worthy of representing the Albanian culture. In the meantime, I have been offered collaboration with an Albanian curator based in Bozen (Italy). The curator is eager to present my work through a personal exhibition. KD: How do you see the art and culture scene in Kosovo? Kosovar Art and culture is very promising and avant-garde, I appreciate it highly. It is a wonder; there is a great number of quality artists who should promote their work in the world. I am a great fan and support Kosovar Art. KD: How can diaspora members contribute to a better image of Kosovo aboard? Kosovars in the Diaspora are currently well integrated in many spheres of life. I would like to see more and more of the diaspora engage in solidarity, civil and cultural organizations that in turn preserve tradition and identity. The greater the success in Diaspora, the more we will be capable of contributing towards improving the image of Kosovo. There is a range of values we could give our contribution to: Kosovo’s culture, architecture, natural resources (a good source of foreign investment) and tourism. All in all, the Kosovar diaspora is vitally important with its contribution to Kosovo. Dr. Shqipe Hoxha: One of Kosovo’s youngest, most motivated and successful doctors!